ABQ CiQlovia: A Sunday of Fun in the Streets! UPDATE 9/8/14: Check out our website, abqciqlovia.org. We have a Facebook page as well, ABQ CiQlovia! The event is coming up quickly and we need funding, volunteers and marketing support. Please click either of the links above for more details! ABQ CiQlovia will be happening on Sunday, September 21, 2014 from 10 AM – 3 PM. We will also be partnering with the Carnuel Parade and Fiesta, an amazing community party and parade! NOTE: This article is about an event I am coordinating for September 2014 right here in Albuquerque, NM! If you’re already familiar with cyclovia or open streets events, skip to the bottom to find out how to get involved. Thanks for reading! Email me if you want a copy of the .doc version of this article. 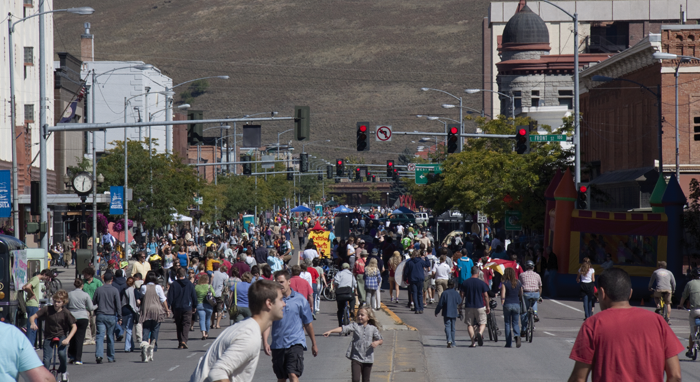 A Sunday Streets event in Missoula, Montana. CiQlovia (pronunciation: \sEk-lo-via\ ) is the Albuquerque version of the global phenomenon known as ciclovia or open streets. Ciclovia literally means “bike path” in Spanish. The word also refers to events where city streets are closed to cars and opened up to people on foot and on bike, outdoor exercise classes and other activities. These events can be weekly, monthly or annual. The first known ciclovia was held in Bogota, Columbia in 1976. Since then, the event has gained popularity and now, every Sunday in Bogota, 70 miles of streets are closed to automobile traffic (Source: http://www.streetfilms.org/ciclovia/). In recent years, ciclovias have spread rapidly across North and South America. Los Angeles (CicLAvia), San Antonio (Siclovia), Tucson, AZ, Lexington, KY and many more cities have launched successful ciclovia initiatives. The time is ripe for an Albuquerque initiative. IMAGINE… if we could safely walk or bike at a relaxing pace on our beautiful city streets without having to worry about our safety, even for a limited time? What if every Sunday was dedicated to providing street space to people for relaxing and recreating? 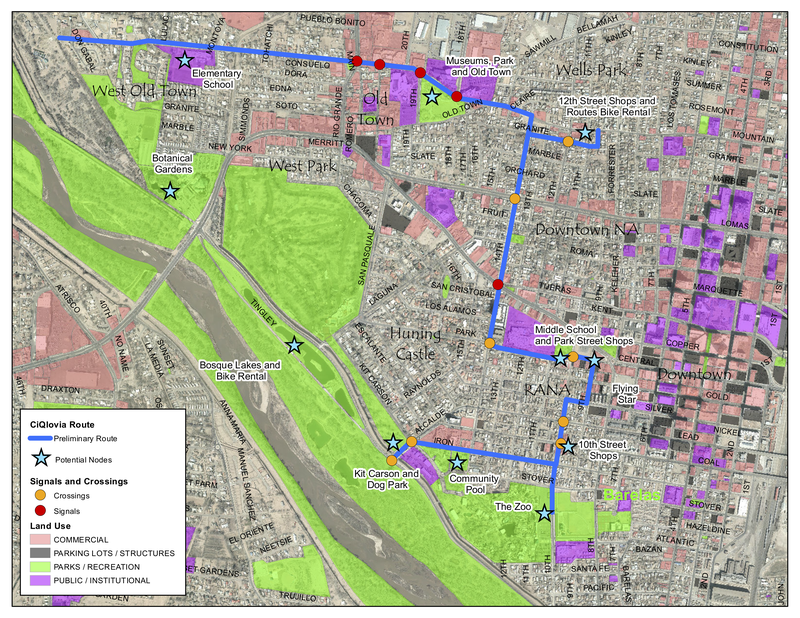 WHY DOES ABQ NEED CIQLOVIA? The primary focus of this event will be health, wellness and quality of life. Albuquerque is a city like no other. We have unique neighborhoods built around art, music, cycling and cultural diversity. We have wonderful year-round weather and an amazing array of outdoor activity options. Unfortunately, we also have high levels of obesity, pedestrian fatalities and poverty. These trends exist for a variety of reasons, but our built environment is an obstacle to physical activity. Many of Albuquerque’s major streets are challenging places to walk and ride a bicycle. When these activities are dangerous, they disappear from our daily lives. Our city is filled with parks and hiking trails. However, it is difficult to enjoy the fresh high desert air in our largest public space, our streets. The secondary focus of this event will be local commerce, economic development and the strong diverse cultural scene found in Albuquerque. Along the route, burqueños and tourists will encounter public art exhibitions, maps and information, outdoor yoga classes, food trucks, and much more. Open lots in targeted nodes will be filled with booths from sponsors as well as local artisans. Pop-up art galleries and coffee shops will fill vacant buildings along the route and existing businesses will benefit from the large quantity of people attending this event. Much of the CiQlovia route will follow the 50 Mile Loop. This project, initiated under Mayor Berry though ABQ: The Plan, seeks to “connect the city’s infrastructure to create a 50 Mile bicycling, running, and walking trail with amenities like benches…way finding signing and maps, [creating] a healthier community and a destination for tourists.” For more information, visit this link: http://bit.ly/JPsEzW. CiQlovia will be an opportunity to promote the value of this innovative infrastructure project. WHERE WILL THE FIRST CIQLOVIA BE LOCATED? This is a map of the proposed route. Stars signify areas with concentrations of programing. The Silver / 14th / Mountain Bicycle Blvd. The route includes commercial clusters, residential districts and cultural centers. This provides ample opportunity for partnerships. Stores and restaurants can bring their wares and tables into the street, providing a new venue for promotion. Neighborhood organizations can use this event for outreach to residents and non-residents who might not know about their projects. Cultural gems, including the BioPark and the museum cluster around Old Town, can take advantage of the high volume of people in the streets to fundraise and provide information about city services. Health and wellness services will be integrated into the entire route. WHEN WILL THE FIRST CIQLOVIA OCCUR? The first CiQlovia will take place on September 21, 2014. Eventually, every Sunday in Albuquerque will have a CiQlovia. Different streets all around the city will be closed off to cars and opened up to people. For now, we are focusing on a single event. Sunday in September makes the most sense for a variety of reasons. Sundays have the least amount of vehicle and bus traffic on the roads. September has great weather, a limited number of conflicting events and many tourists in town for the Balloon Fiesta and ¡Globalquerque! (September 19-20, 2014). The Balloon Fiesta – occurs at the beginning of October. The Duke City Marathon – occurred after the Balloon Fiesta in 2013. The Day of the Tread – occurs in late October around Halloween. Dia de los Muertos Parade – occurs in early November. WHO WILL BE A PART OF CIQLOVIA? The short answer is everyone! CiQlovia will be an inclusive event. Anyone can easily be a part of the festivities. We are aiming to attract people who want to be outside and participate in physical activity, engage with local businesses and see the cultural gems of Albuquerque in a way they never have, on streets full of people. Potential funding sources fall into two categories: local and national. Donations from businesses will be collected and allocated through the Community Health Charities of New Mexico non-profit and the Healthier Weights Council. Their coalition of public health organizations will provide a framework for support. We will also seek financial support from county commissioners, the City Council and the Office of the Mayor. Gold and platinum level sponsors will be advertised heavily on t-shirts, the CiQlovia website, etc. The names of the levels align with the bicycle friendliness assessment system used by the League of American Bicyclists in their Bicycle Friendly America program. More information can be found here: http://www.bikeleague.org/bfa#community. Using the Tucson Cyclovia 2012 model and numbers, our running budget is somewhere between $50,000 – $100,000. The final amount will depend on in-kind donations, volunteer support, etc. In Tucson, ¼ of costs were labor, another quarter was for cops and barricades and the other half was a variety of other smaller expenses. Regarding revenue, about ½ of all donations came from small-scale sponsorships. Sponsors will have first pick of location for their booth. Other booths will fill in the remaining spaces based on interest from vendors. Vendors will need to acquire a permit from the organizing committee to set up shop. Different areas will be designated for certain types of vendors. There will be a permitting system in order to properly accommodate people who want to participate in CiQlovia. The landowners at the proposed nodes need to be contacted. Since it will be a Sunday, use of parking lots should not be difficult. We have identified the parking lot on the corner of Park and 9th as the most suitable location for a food truck and live music node. People on bicycles and people on foot will naturally be attracted to this event. Attracting other demographics depends on activating the route with other forms of physical activity. Multiple nodes will include outdoor yoga classes, stretching workshops, bike repair stations, etc. Promoting alternative transportation will be an important part of this event. ABQ Ride will be involved, as well as representatives from the Esperanza Bike Shop. Parks & Recreation could staff a Bike Rodeo at one of the public sector nodes. Local nonprofits such as Duke City Wheelmen and BikeABQ will be integrated into multiple nodes. In Tucson, the event included a portable outdoor mini skate park. There are unlimited methods for involving all members of our community. One of many amazing murals in Downtown ABQ. Activating the route with art and music will set this event apart from other ciclovia events across the nation. Art is an important part of our local culture. Although many people visit Santa Fe, far more live in Albuquerque, the cultural and geographical heart of New Mexico. Public mural art is being legitimized primarily through the efforts of Warehouse 508 and 516 Arts throughout Downtown Albuquerque. These organizations must be involved early on in the process. We envision public art display, live painting, vendors selling art, live poetry readings, etc. Interactive art would align with the goal of this event: activating the street as public people based space. There are galleries all along the route with a heavy concentration in Old Town and along the Mountain corridor. Live music will be located within the commercial nodes. The fitness nodes will likely have recorded music so it makes little sense to locate live music in those locations. Live music will provide a good complement to the food truck nodes. The proposed route is lined with some wonderful local businesses. Since many of these businesses are not usually open on Sundays, we will reach out to them and help them understand how important it will be for them to be open on CiQlovia Sunday. In addition, they will be encouraged to occupy the street in front of their establishment in some way. Narrowing the street using tables and chairs would provide an interesting visual experience for attendees. Local merchants will be integrated into both the nodes and empty spaces along the route. We will integrate strategies from Team Better Block into this event. It will involve occupying vacant space with temporary pop-up businesses. Established local artisans will apply to use these spaces through the same process they will apply for use of vacant lots and street space. This event will have a fitness first focus and local commerce will be of strong secondary importance. It will allow us to gain more partners, funding and support. Every Sunday morning, cyclists, pedestrians, rollerbladers, skateboarders and many other users fill the Bosque Trail in Albuquerque, NM. On CiQlovia Sunday, signs will direct users from the trail into the neighborhoods. Many of these users will have never visited these areas, so the signs will emphasize the wonderment that will be found along the route. CiQlovia is an opportunity for Albuquerque to show off our incredible diverse community. Ciclovias have been done throughout the Americas but this will be the first CiQlovia! I look forward to your feedback and thank you in advance for your support! Coordinator: Dan Majewski – dan.j.majewski@gmail.com.